During the first half of the 1900's, physicists were still trying to figure out exactly where radiation in the atmosphere came from. They'd already discovered that some materials were radioactive, but there were also theories about cosmic radiation (radiation from space). To answer this and other questions, scientists (or brave expendable people trained for the job) would go up in balloons to extreme altitudes. They'd take the various crude radiation measurement equipment of the time with them and chart how radiation varied with altitude. What they found was radiation levels were high (relatively) near the surface of the earth, low levels in the mid-atmosphere, but yet high again near space. What did this mean? The reason was because near Earth radiation had come from radioactive materials emitting energy, but the near space radiation was from the cosmic radiation background. This was a very important finding for space physics. The experiments which we perform below are an imitation of those famous historical experiments. The difference is we are using modern electronics to record the information for us - no expendable human pilots needed. If you would like to learn more history, here are a few interesting sites to read. 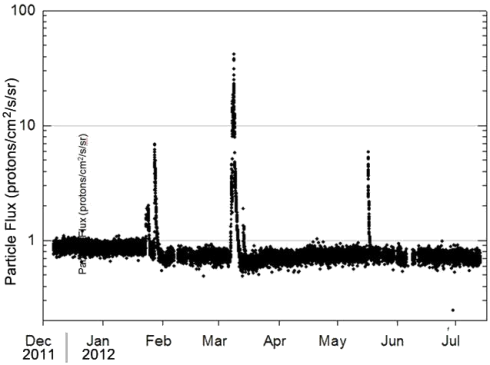 This graphic shows the flux of radiation detected by NASA's Mars Science Laboratory on the trip from Earth to Mars from December 2011 to July 2012. The spikes in radiation levels occurred in February, March and late May of 2012 because of large solar energetic particle events caused by giant flares on the sun. The data were obtained by the Radiation Assessment Detector on Curiosity....The MSL spacecraft structure (which includes the backshell and heatshield) provides significant shielding from the deep space radiation environment, reducing significantly the particle flux observed by the Radiation Assessment Detector. Clearly, March was a great month for astronauts to eat popcorn. A Geiger Counter is a sensor used to measure radiation. The one we chose was the Geiger counter from Electronic GoldMine (Item Number C6979) (pictured below). 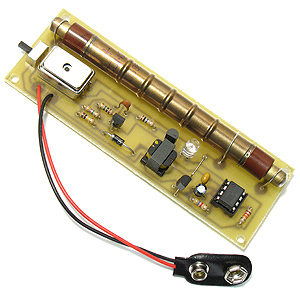 As the site says, this "sensitive geiger counter kit uses a Russian geiger mueller tube and is sensitive to Beta and Gamma rays." It requires a 9V battery to power, while current draw is really small. I used a non-rechargeable lithium 9V battery as they are rated down to -40C before failure. A typical battery, including lithiums, will fail by -20C. Just one battery is good for several flights. The GoldMine counter has a built in LED that flashes whenever a pulse is detected. As the blue LED is a diode, it has a voltage drop across it up to 4V. To use a microcontroller to detect the signal, attach your digital I/O interrupt pin on the positive part of the diode, and ground on the negative end. If a gamma or beta ray is detected, it will pulse about ~6 times, spaced at about 8ms per pulse. Your microcontroller simply needs to count all pulses within a specific time (interrupt on rising edge) to record a single ray detection event. If only 2 or 3 pulses are counted, then the microcontroller should just ignore it as a false signal. 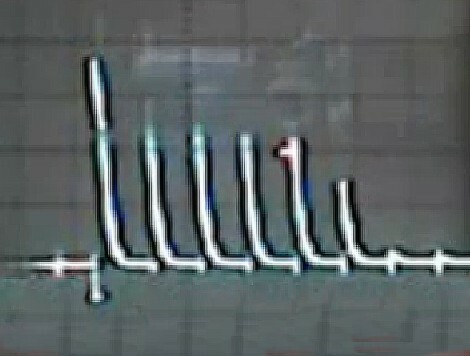 Below is an image from an oscilloscope of what a single gamma ray detection will look like. Note that a 4V spike would risk damaging a 3.3V microcontroller, such as the Axon Mote microcontroller (which I used). To correct for this problem, you just need to replace the blue LED with either a green, yellow, or orange LED. This is because different color LEDs have different voltage drops, and these three colors have the voltage drop you need. 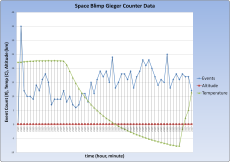 Geiger counters inherently use high voltages for them to work. Normally that's not a problem here on Earth, as air acts as a natural electrical insulator preventing high voltage electronics from jumping around. But the balloon will rise towards space, where there will be less than 3% atmosphere. When the resistance of air is removed, electrons will start jumping small gaps - effectively causing an electrical short. Sparks, literally, will ensue. To test if this would be a problem, I placed our Geiger Counter into a vacuum chamber (available in any professional chemistry lab). Sparks everywhere! As such, without modification, it won't work for space. To solve the problem I covered the high-voltage components with hot glue - a very effective insulator. The following video demonstrates my Geiger Counter tests. Yea, for a robotics engineer, I can be really dumb sometimes . . . The website SpaceWeather.com publishes current space weather data. 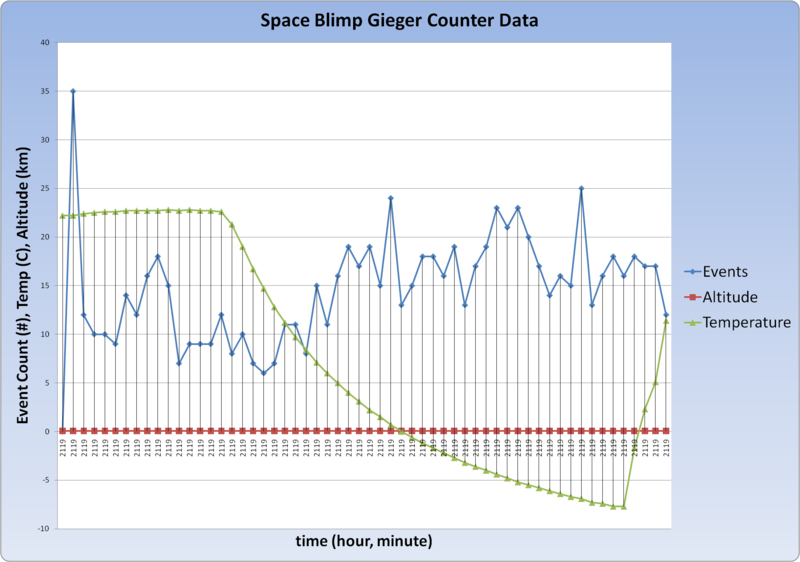 You can get information on current and predicted solar flares, and even compare your cosmic ray flux data with theirs.